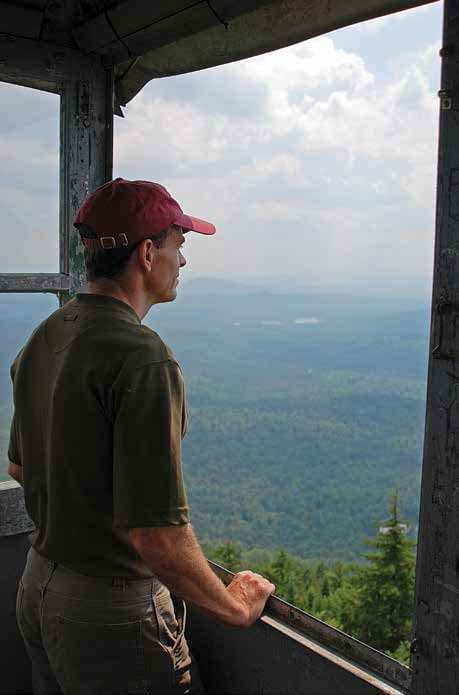 A hiker relaxes beside Goodnow Mountain’s restored fire tower. I GLANCE AT MY WATCH. 11:22 a.m. It feels like 7 a.m. on this early September morning. The first hint of fall is in the invigorating fifty-degree air. Goosebumps cover my legs below my shorts, and my breath exhales in faint misty tendrils as I start up the sun-dappled Goodnow Mountain Trail. Some days it feels good to go hiking. This is one of them. I’ve hiked Goodnow Mountain only once before, while working on my guidebook Hiking the Adirondacks. I wonder if anything has changed in the five years since. I chose Goodnow Mountain, elevation 2,694 feet, on this fine day not to find out but to simply get out, or perhaps I should say “up,” as getting a view from the top of this mountain is my goal. The sky is haze-free and as blue as a mountain bluebird’s feathers. I don’t want an epic day in the High Peaks, just a nice walk in the woods to stretch my legs and get my heart rate up, with a 360-degree panorama to reward my effort. 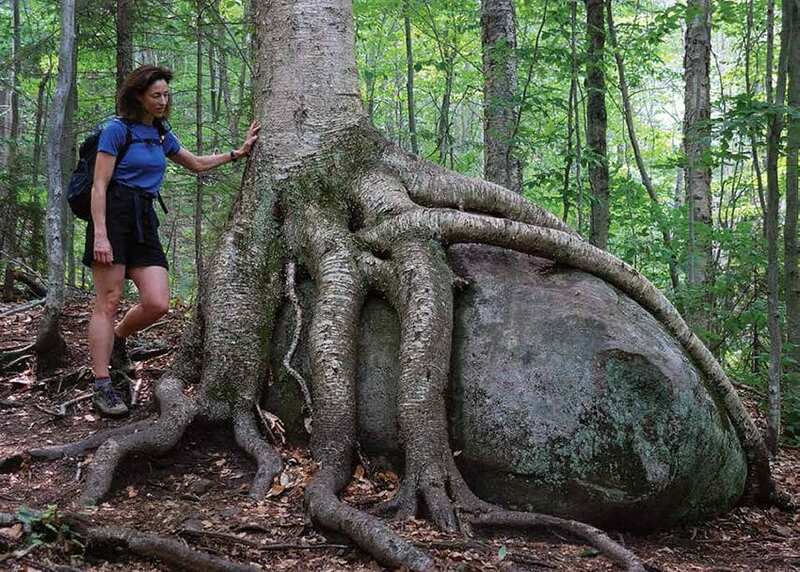 Located two miles west of downtown Newcomb near Rich Lake, Goodnow Mountain is named for Sylvester Goodnow, a homesteader who settled at its base in the 1820s. 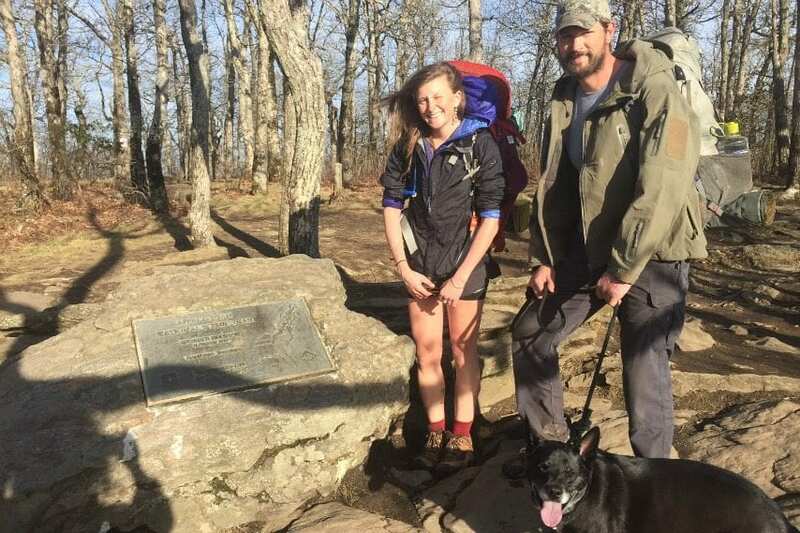 It’s an easy climb (1,035 vertical feet) with moderate mileage (four miles out and back) on a well-maintained trail to a fire tower. Perfect. As I head into the woods, I’m surprised that I have to jump one and then another mud hole. Though the streamlets across the trail are dry, the trail is wet. On such a dry, clear day, how could there be mud? Then I recall a heavy downpour two nights earlier. 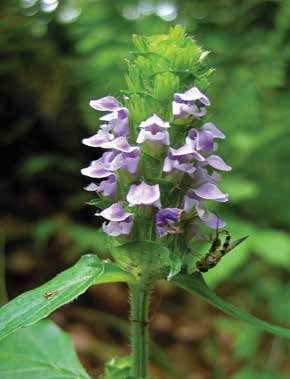 Goodnow holds its moisture, which makes it a haven for frogs and toads and at least a dozen different fungi and mushrooms. I stop to photograph an artist’s conch perched on a tree trunk like a shelf for an elf, then click on a clump of creamy, deeply crevassed mushrooms that look like rubbery blossoms. A short time later, I point my lens at the red berries on hobblebush, its leaves displaying patches of purplish red. The calendar declares autumn at the equinox, two weeks away, but it has already arrived at Goodnow Mountain. Though the numbers along the trail have no meaning to me, I appreciate ESF’s and the town of Newcomb’s trail work. 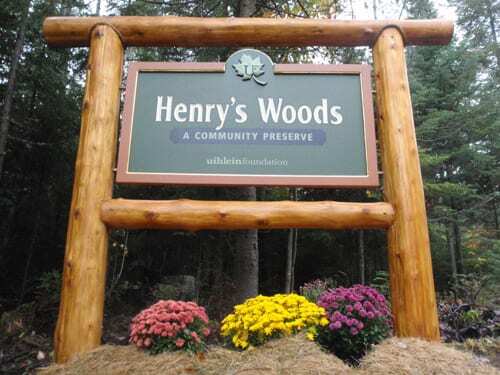 Goodnow Mountain is the highest point within the fifteen-thousand-acre Huntington Wildlife Forest, which is run by ESF as a field station for wildlife research and ecological studies. The students’ engineering feats include wooden stairs, footbridges, and water bars. At 0.6 miles, the trail turns upward over railroad-tie steps and a bog bridge. I spy a fifteen-foot-tall dead tree trunk, weathered and stripped of its bark. The hollow on the uphill side of the tree is roomy enough to bring to mind an enchanted telephone booth. 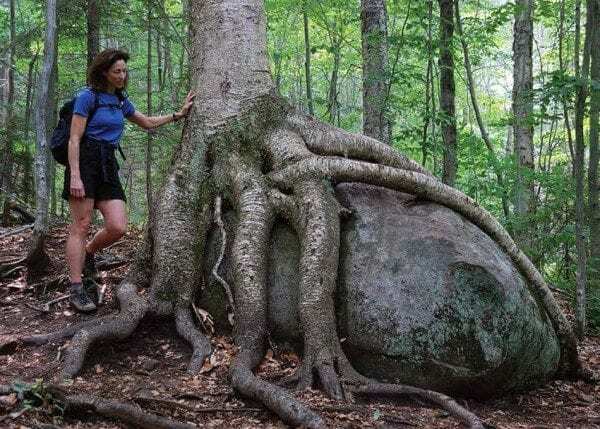 But more curious is the way the entire trunk twists up the hill as if Paul Bunyan had reached down and given its top a twirl. Lisa stops to admire the Octopus Tree along the hiking trail. My breathing quickens as the trail gets steeper, but the exertion is temporary. The trail soon eases again, crossing another bog bridge. 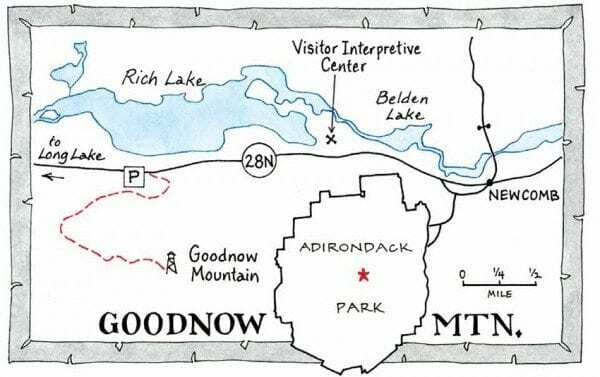 Goodnow is good to hikers that way. It pushes, then offers a reprieve. At interpretive marker number 7, the trail makes a sweeping arc along a shoulder of the mountain and then heads slightly downhill. My stride lengthens and my pace picks up, but I stop short when a face catches my eye. A bald, happy man stares at me, not a real man, but the visage of one on a waist-high rock. A crack across the lower part of the rock forms his mouth. Shallow dents in the rock enhanced by smeared moss form his eyes, nose, and Hitler-esque mustache. I chuckle at this new sight along this old trail. The barn has not fared well over the past five years. Before a few boards were missing; now an entire side of the barn is gone. Beams of sunlight shine through a hole at the peak of the roof. The structure looks as if it will collapse in the next heavy snowfall. I imagine Archer and Anna Huntington prancing up the trail on spirited horses to this elevated outpost, when a voice surprises me. I turn to find a fit-looking sixtyish couple. “You’ve gone about two-thirds of the way,” I estimate. In fact, we are closer. I continue toward the summit with the Ohioans. After a short climb, we enter the boreal zone. The change in flora is sharp and distinct. The leafy birches, maples, and beeches instantly give way to spindly conifers. The summit feels close as the trail bends around a knob of land that offers glimpses of blue sky through the fir boughs. Soon after we pass a view of distant peaks, the fire tower is before us, perched on a hump of bedrock. The couple immediately mounts the steps while I take more photos of the tower itself, the survey disk in the bedrock, and some of the nearby summit flora, but given the lack of a vista from the ground, the temptation to climb the scaffolding is too great to resist for long. The tower is a tall one, scratching the sky sixty feet above the bedrock. The steps are well-maintained and feel solid underfoot. The view from the cabin is an eye-popper. I take my time ogling the Seward and Santanoni ranges, Algonquin Peak, Mount Colden, and Mount Marcy to the north and Rich Lake below. The Goodnow Flow looks like a green meadow from this height. A circular map, once used by the fire watchers, helps me identify landmarks in the panorama. 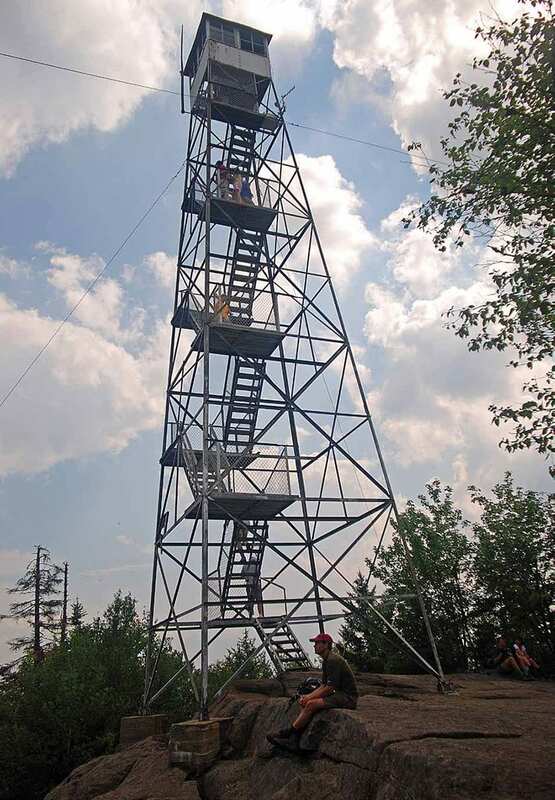 The tower offers a panoramic view of the Adirondacks. After taking my fill of the expansive view, I descend to check out the fire watcher’s cabin just below the rock knob on which the fire tower is perched. 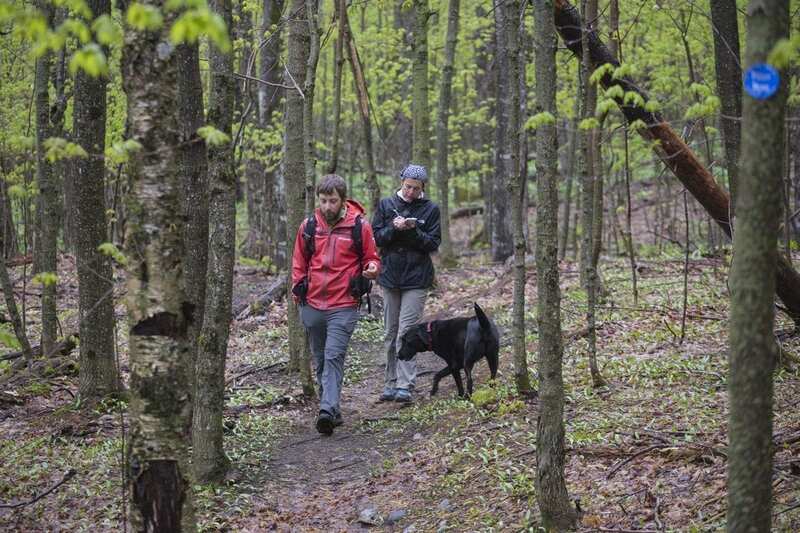 If the tower is the hiker’s cake atop Goodnow Mountain, the cabin is the frosting. Though it’s locked, I could peek in the window to see the interior, which has been restored with typical furniture and items used by the watcher, including a classic Adirondack pack basket, which hangs on the wall as if its owner just stepped out for a walk. A placard tells the story of the tower and includes photographs of two fire watchers, George Shaughnessy (1930) and Walter West (1962). A page from a 1936 watcher’s log is taped to the door. A mountaintop mini-museum, the cabin gives modern-day hikers a sense of what life was like at a working fire tower. “What’s a pack basket?” asks Mrs. Ohio. “Guides used them the way we use backpacks today,” I reply, shouldering my daypack, glad for its modern design. I was first there in 1971. The horse stable was still there in excellent condition, looking as though it had just been used a few years earlier. Contrary to published reports that the tower was manned only up until 1970, it was still manned in 1971 in the Summer by a young female ranger and her guitar. I spent about 2 weeks camping up there with my girlfriend taking icy baths from the well next to the horse stable. I was actually there for about 3 days before coming across another small cabin with an old Franklin stove next to quite a large foundation and very large fireplace/chimney where we had some incredible bonfires. The trail to this area had been disguised and planted over with tree saplings and other vegetation so that it would not be disturbed. I would later find out from the ranger that the larger cabin had burned down just a few years prior and had belonged to the U. of Syracuse for wildlife observation and tracking. At that time there was also another small shed that still housed all types of early electronics which were no doubt cutting edge at the time. I returned there about 5 times up until 1978. I went back again in the early 90’s and the trail was closed to the public by the University and even had no-parking signs posted by the trail head. I long to go back and see what the years have done.